Mr. Dietrick attended Moravian Academy in Bethlehem, Pennsylvania and Monmouth University in Monmouth, New Jersey. 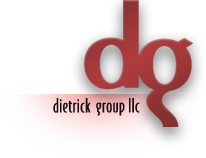 Prior to opening the doors to Dietrick Group, LLC in 2006, he was Partner of Dietrick Group Consulting and a Sales Representative with Verizon Wireless. A licensed Pennsylvania Realtor, Ryan also has his ACOM designation from the Institute of Real Estate Management (IREM). Ryan is an active participant in Moravian Academy’s Summer Bridge program as a member of the Board and Marketing Committee and also sits on Moravian Academy’s Alumni Advisory Board. Ryan is, undoubtedly, the Washington Redskins’ biggest fan. He enjoys following NBA basketball and his beloved bulldog, Scooter.